When compositing your scene, it will often happen that you want to animate the parameters of an effect over time. You might want to have an object fading in or out by changing the transparency level over time or increasing the colour contrast on one of your drawings over a certain frame range. To animate an effect over time, create a function curve by adding keyframes to the parameters you want to animate. To do this, you will use the Layer Properties view, the Network view and the Timeline view. You can fine tune your animation using the Function view. 1. 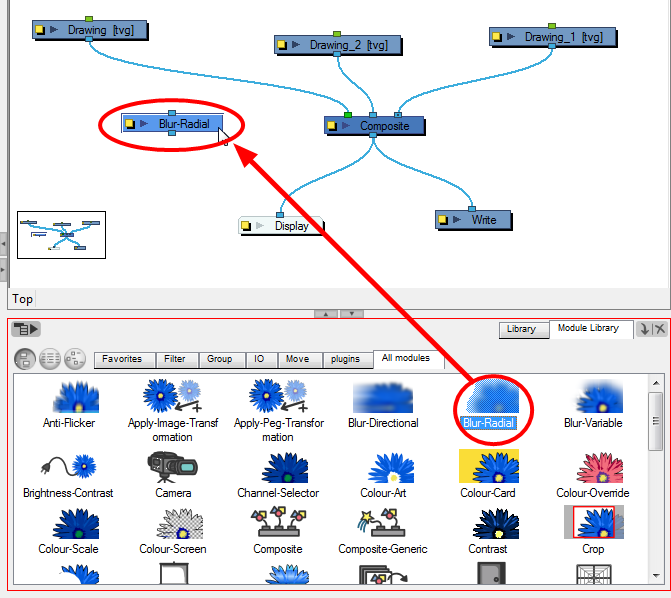 In the Network view, drag an effect module from the Module Library view and drop it into the Network view. 2. Plug the effect element between the drawing element that you would like to apply the effect to and a composite module. You can either do this manually by unplugging and plugging, or by holding down [Alt] as you drag it through a connection. The effect should also appear in the Timeline view as well. ‣ In the Layer Properties view, click on the Function button you want to animate to create a function curve. ‣ You can also expand the effect layer's parameters in the Timeline view by clicking on the Expand Function button and add a keyframe to the parameter you want to animate or press [F6]. 4. In the Timeline view, click on the Show Data View button. 5. In the Timeline view, go to the frame where you want to start animating the effect. 6. In the Data view, click on the Add Keyframe button. 7. In the Value field scroll to the keyframe value or type the value in the field. ‣ If your keyframes are stop-motion keyframes, in the Timeline view, select the new keyframes. Right-click on the selection and select Set Motion Keyframe. 8. Repeat this process for each keyframe to be added. Refer to the Previewing and Playing Back Effects to learn how to preview animated effects.